A flexible framework to help you better understand your clients' needs and the value you can provide to them. What has changed since your last customer check-in? Review recent events and key metric updates to gain an up-to-date, accurate understanding of your client. How has our team helped this client achieve their goals since their last customer check-in? How can we improve these factors? Does the customer have any problems with our products or services? Identify all risks that may lead to customer disengagement or churn. What specific goals does the client want to achieve before the next customer check-in? How can we help? Are there opportunities to increase the value we provide this customer? List all insights and actionables worth sharing with other departments. In 1-2 sentences, summarize the current state of the customer so other team members can understand our relationship with them. Consider the information above, key metrics, and overall sentiment. Customer relationship management is the engine that drives your business forward. Gain an unparalleled understanding of your clients' needs and the value you can provide them with our customer check-in template. Our customer check-in template is ideal for teams of all sizes, from individual sales reps paying a visit to a client's office, to small startups getting their customer success team off the ground, to enterprises revamping their customer relationship management to be more robust. True customer success is only achieved when you understand and prioritize the customer's needs. This meeting note template is customizable so you can easily tailor it to elucidate your customer's pain points. 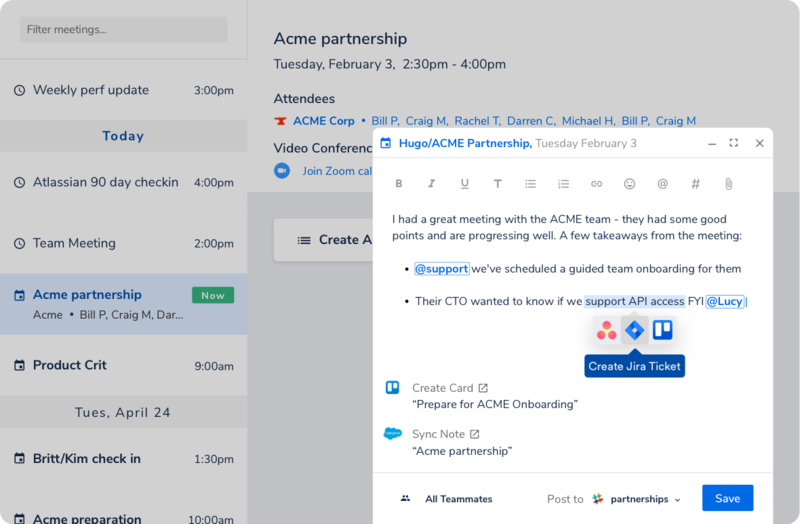 In turn, this lets your team pinpoint solutions faster. With this outline, you can organize and share insights seamlessly, allowing your team members to gain a holistic overview of your customer relationships so they can identify and implement opportunities for growth and improvement. When used correctly, this customer check-in template can become the blueprint you need to build a better future for your customers and your business.